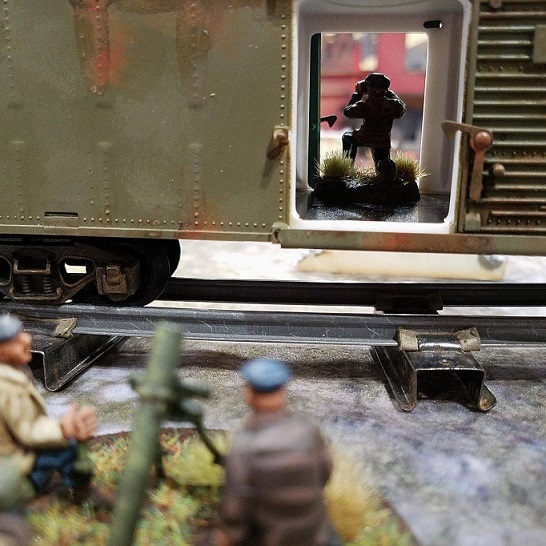 First off, we want to thank Jeremy Williams for running a great event as well as sending out thanks to all the folks who donated terrain for the Bolt Action events at Adepticon this year. 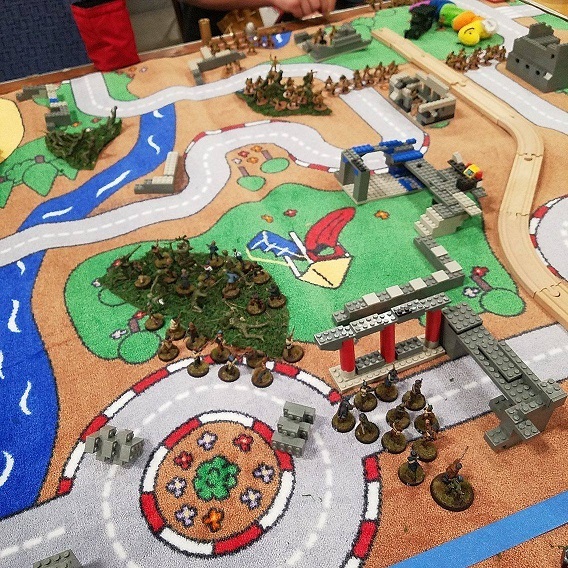 The custom tables that make the rounds are always fun to play on, and without terrain the events could not happen. So huge props to all those who put their time, effort and personal property into making these tournaments happen! When we began planning out the Partiboys, right at the end of Operation Sting in November, we didn’t have any particular historical theme in mind. We just knew that the partisans sounded like a fun army to paint and that we had tracked down a hilarious, but completely out of scale, model bus that would be a one-of-a-kind display for the army. Five months later, they were ready to roll, and when we rolled the Partibus to the Doubles event we were thrilled by all the people who came up and looked at or took pictures of the setup. We went into it with a lighthearted attitude and we loved that other people took it in stride. Our army ended up including models from 9 different companies. Warlord, Rubicon, Footsore, Empress, Victory Force, Black Tree, Artizan, Matchstick and Perry Miniatures all made appearances. The bus itself is from Heller. We also were granted the honor of a paper banner made by Duane Zoldak that makes an appearance on one of the trucks in Andrew’s force. There was a bit of worry that scaling would be an issue with so many companies involved, since even among 28mm miniatures there are a variety of model sizes. If you look closely you can pick some of them out, but overall we were very happy with how well the army blended together. And as we joked time and again, the Partisans come in all shapes and sizes, just like real people. The armies that were brought to the event this year included some great submissions. 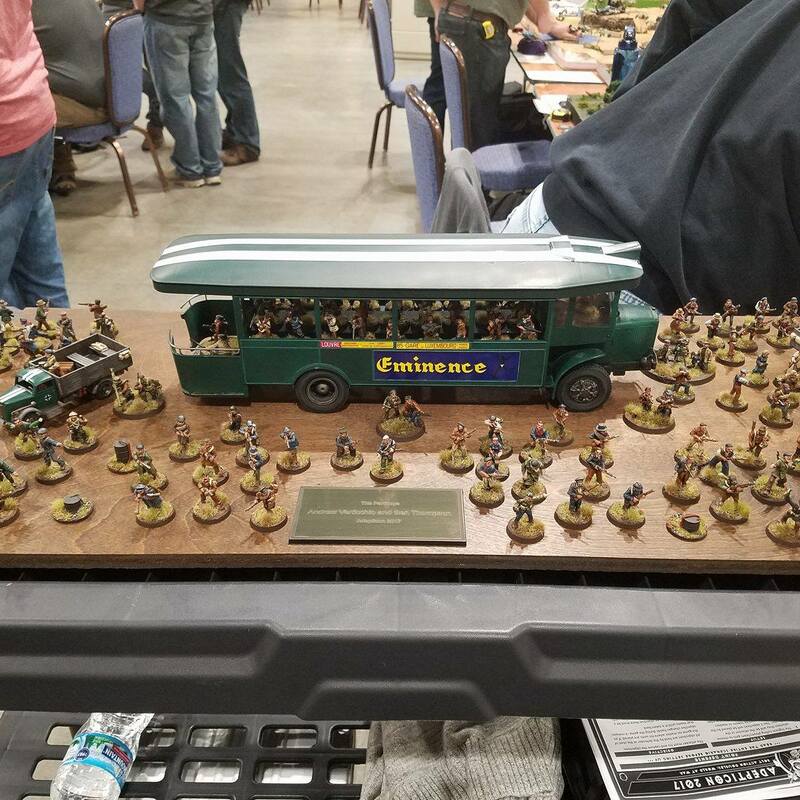 Jeremy Olsen and Dan van Hese took home the Best Appearance award with a Defense of Berlin Last Levy army on the beautiful display board pictured below. Our first game was against team Derek and Son, playing a pair of Soviet platoons. We played on a table that initially seemed like a joke when we saw it the night before, a classic child’s play mat complete with ruins built out of Legos and other cover made up of Beanie Babies and Hot Wheels, with forests of green army men. The objective was to control quarters of the table, with our armies starting on opposite corners of the board. Our opponents were fielding a massive quantity of inexperienced troops supported by a few regulars and a powerful lineup of indirect support, including an artillery observer, a Katyusha multiple-rocket-launcher, and several heavy mortars. The middle of the field was hard fought, with two partisan rifle squads and their lieutenant having to attempt to sprint away from the forest they were using as cover when artillery rained in on them, as well as an unlucky Soviet inexperienced squad running into one of our sneaky Partisan bomb tokens and losing 10 of their 12 men in an instant. This particular mission did not allow for outflanking reserves, so Andrew brought his trucks up along the roads to get double movement and aggressively contest Soviet advances into our territory as well as advancing on the right flank. In the end, we were able to keep the Soviets out of our deployment while also getting some scoring units into both neutral table quarters, and one unit into their deployment quarter, giving us the major victory. The Partisans that made it all the way across the field was the two remaining men from a 12 man inexperienced pistol squad and they were forced to pass a leadership 6 test to stay on field. 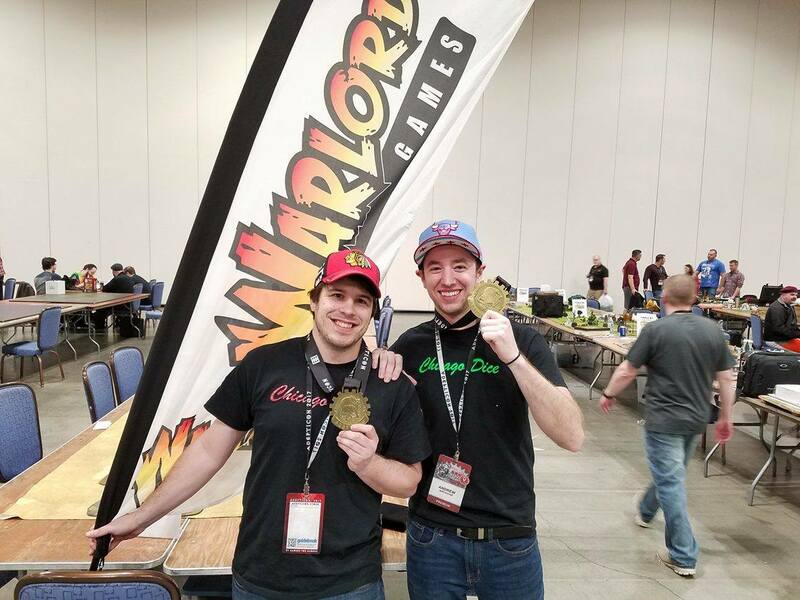 Game two was against Sean Vilmont and Ryan of the Wahoo Warriors and was an objective capture game. We had five objectives on the board, in a rough X formation with two in each deployment zone and one in the middle. Our opponents ran a tank platoon with several Panzer III’s and a Flammpanzer, along with flamethrower in a Kubelwagon and a double platoon of Finns. They also had special rule in effect due to tournament scenarios that added a fuel shortage rule, making it possible for their tanks to become immobilized after moving. Both sides took and held their rear objectives fairly easily. Unfortunately our opponents had better cover leading up to the middle objective but wisely stayed behind the forest for first few turns so that we couldn’t engage the units that were going to advance onto the fifth objective by games end. Highlights from the game included a Partisan flamethrower outflank on right side, killing a Finnish truck that had a lieutenant in it. The pistol squad and its truck from that side also arrived in the same location and killed off an infantry squad that had attempted to break our hold on one objective. One of our snipers died in a duel with two Finn sniper teams, and two German tanks were stuck due to running out of fuel, but were in good position to ambush and support their infantry. Then in the final turn our veteran SMG partisan squad failed its morale check on an outflank attempt and ruined our planned incursion on the left flank targeting one of their rear objectives. 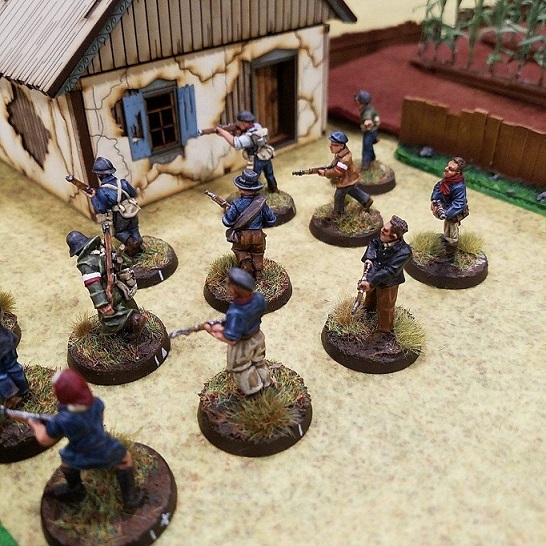 A close and well-played game, resulting in a minor loss for the Partisans. In game three we played against the Hayes brothers running a double-German list. One tank platoon consisting of a Stug, a Tiger 1 and a Puma armored car. The other platoon included an MMG, StuH 42, Flakvierling and several infantry squads. The mission was the classic Maximum Attrition format with standard deployment. The Germans were well dug in in a ruin in the center of their deployment zone, with the Puma and MMG covering our right flank, and the Stug and Stuh on the left. Some infantry, their Flakvierling, and the Tiger sat in the middle. The Partiboys advanced en masse, using a large factory ruin as cover for the most part. For much of the game the killpoints were 1 each, with many Partisan squads depleted but not destroyed. Outflanks on the left by our bazooka team took out the Stug, and a pistol squad with its truck was able to move in and break the rear-left guard by a Grenadier squad. The right flank included several partisan squads (including a flamethrower) coming from outflank into a woodland and destroying the MMG that was over there while the Puma recce’d away. We never really breached the center line, although the mortar along with sniper fire was able to eliminate the Flakvierling. The Tiger caused major damage to several partisan squads, but wasn’t able to break them when they got into cover in the ruined factory. Major victory to Partisans on killpoints, but closely fought up until the end. Bolt Action Doubles were the primary focus for us at Adepticon 2017. We tweaked the list several times, played a few test games, and put a lot of time into getting them painted up. The games were great, and in the end we were able to take home the Best Sportsmen award, the top award Jeremy gives out for the doubles event. All in all, a great success. We’ve already begun planning out armies for Doubles next year as well as the various tournaments in between. For those of you who play, we hope to see you there!